"The doctors at the Mayo Clinic diagnosed me with early onset dementia (“Alzheimer’s Type”) at the age of 59"
Most sports fans, men and women alike, know the name Pat Summitt. 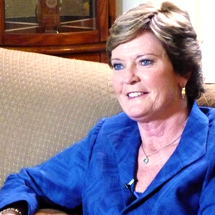 Pat and her teams won 1,037 basketball games, hold eight NCAA Championships, and won 29 Southeastern Conference titles. Unprecedented. Pat is a sports champion and a winner. After watching her speak in the video below I immediately thought, Pat will be a winner in life too. Pat now faces her greatest challenge. Throughout my career, I have always made it a point that my life and my basketball program were an open book. With that in mind, I have something I’d like to share with my Tennessee families – the university, boosters and fans of Lady Vol basketball. Once last season concluded, I addressed some ongoing concerns regarding my health. After consulting with my local physicians, I decided to visit the Mayo Clinic in Rochester, Minn. Earlier this summer, the doctors at the Mayo Clinic diagnosed me with early onset dementia (“Alzheimer’s Type”) at the age of 59. I plan to continue to be your coach. Obviously, I realize I may have some limitations with this condition since there will be some good days and some bad days. For that reason I will be relying on my outstanding coaching staff like never before. We have always collaborated on every facet of Lady Vol basketball; and now you will see Holly Warlick, Dean Lockwood and Mickie DeMoss taking on more responsibility as their duties will change significantly. I love being your coach, and the privilege to go to work every day with our outstanding Lady Vol basketball student-athletes. I appreciate the complete support of UT Chancellor Dr. Jimmy Cheek and UT Athletics Director Joan Cronan to continue coaching at the University of Tennessee as long as the good Lord is willing. I’ve been honest and shared my health concerns with you and now we’ll move forward to the business at hand…coaching a great group of Lady Vols. For the time being, I hope you will respect my privacy regarding this matter.